We invite you to explore India - the Land with infinite beauty ! Whether you soar high into Himalayas or peer under the ruins of the Ancient monuments dotting the landscape of India, you will cherish the experience long after your visit ! This India Travel Guide on Our Lady of Ports Cathedral Ernakulam is free from any commercial interest! This site is dedicated to promote India - the vast subcontinent, its glorious past, magnificent landscape and its infinite variety. Located in Ernakulam, Kerala, St Mary's Cathedral Basilica (Thuramukha matha palli in Malayalam) is one of the prominent Marian Pilgrim Centers in India. Founded in 1112, the cathedral is dedicated to 'Our Lady of Ports'. 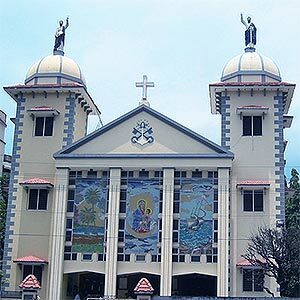 Built in the early twentieth century under the direction of Mar Louis Pazheparambil, the cathedral was elevated to the status of a Basilica by Pope Paul VI on 20 March, 1974. A visit to this Basilica will leave the tourist with treasured memories. Situated near the High Court Junction, the Basilica is easily accessible by road. The large, tall and spacious Cathedral has an altar that was used by John Paul II, when he visited India during 7 February, 1986. The altar depicts the Birth, the Crucifixion and the Resurrection of our Lord Jesus Christ. On the right side are two tall towers - 68 feet tall with Pathrose and Paulose statues on top and the bell tower (88 feet high) with St. Thomas statue on top. There is also a beautiful depiction of Jesus Apparition to St Thomas. The House of Perpetual Adoration can be found opposite to the office of the Cathedral. The basilica is the headquarters of the Major Archdiocese of Ernakulam- Angamaly, which is the Episcopal See (Bishop's cathedra or Bishop's Throne) of the Syro-Malabar Church. Ernakulam is reachable by air, road, railroad, ferry and boat services. Ernakulam is connected to all cities in India by railroad. There are two main stations, Ernakulam Junction and Ernakulam Town also known as North station along with additional train stations in Cochin terminal, Aluva and Tripunithura. The central bus station is situated in the heart of Ernakulam city and is very close to the Ernakulam Junction railway station. Long route private buses operate from High Court Junction, Railway Station and Kaloor Junction. Taxis, buses and auto rickshaws are available for local transport within Ernakulam.